Located on the Grand River, Grand Rapids is the second-largest city in Michigan. Its population, according to the 2010 census, was 188,040. If you call Grand Rapids home and find that you’ve gotten yourself into a sticky situation with credit cards and other types of debt, you can be sure you’re not the only one. There are things you can do to improve your situation, however, so don’t fret. Whether it’s debt settlement, debt counseling or debt consolidation, Grand Rapids residents can find help today. Call 800-910-0065 now for your free debt evaluation to find the solution that best fits your circumstances. There’s more than one way out of debt. Start your journey to financial freedom today. For those struggling with debt, there are a variety of debt solutions available. There may not be a one-size-fits-all solution for debt, but there are options that could fit your particular situation better than others. Here’s an overview of what may be available to you in Grand Rapids. Grand Rapids locals with more than $10,000 in debt might qualify for debt consolidation. A consolidation loan could help you pay off your current debts at a lower interest rate. This method also allows you to make your payments to a single debt consolidation company or bank, instead of multiple creditors every month. If you don’t have massive debt, then debt counseling could be right for you. A counselor may help you build a budget that frees up more money each month so you can pay down debt. Keep in mind that debt counselors could refer you to other services, such as debt consolidation. As a resident of Grand Rapids, research counseling services in your area for a comprehensive list of services. Debt resolution could be your answer if you’re struggling with a low of debt. With debt resolution, you work with a company to actually reduce the total amount you owe. While you save money in a savings account specifically set up for this purpose, the company negotiates with your creditors on your behalf. When the debt settlement company reaches an agreement with one of your creditors, you can settle the debt with the funds you saved. The process repeats with all your enrolled creditors until your debt has been resolved. Denizens of Grand Rapid can also consider other debt payment options such as minimum payment plans. However, sticking with minimum payments could lead to you paying more over time thanks to compounding interest. Property-wise, the forecast is good for those who live in Grand Rapids, Michigan. The median home value rose 11.8% over the past year to $133,500. And if you’re a renter in the “River City” you can expect to pay $1,250 per month on average. 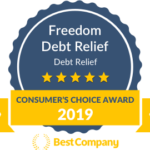 But regardless of whether you own your home or rent an apartment, if you have debt you’d like to resolve, take steps toward financial freedom now by speaking with a debt specialist. You may be surprised by the number of options available to you. It might not be right for you, but debt consolidation in Grand Rapids could be worth looking into. Debt consolidation may simplify the debt repayment process. Keep in mind that most consolidation loans require collateral — a high-value asset such as a home or a car — that you must leverage in order to receive the loan. While this might help you get a lower interest rate, if you do fall behind or can’t make your payments, you could lose your leveraged asset. That means your house could be foreclosed on or your car seized.